Greetings loyal servants of the Overlord, it is I your minion master Gnarl with another Minionstry of Information brought to you by those dimwits at Codemasters. I get the impression from my Twitter that they aren’t being particularly forthcoming with information so I sent the browns out to capture one of the developers and we rubbed a green on his face until he agreed to talk. Here’s how our little “interview” went. Not everybody wants to share power you numbskull, what’s Overlord like for people who like to play with themselves? 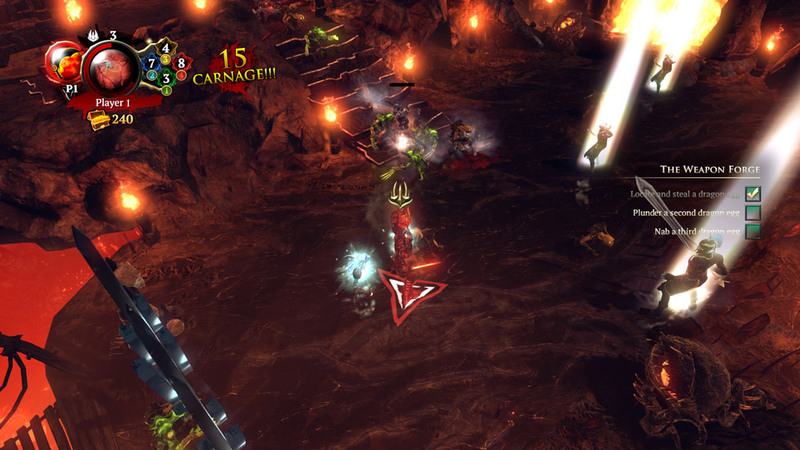 Overlord: Fellowship of Evil is designed to work well for the solo player, as well as in multiplayer. We wanted to ensure that, what with the previous games being primarily single-player affairs. In solo play various elements of the game will be tuned for an optimal experience. For instance, enemy encounters will have different spawn patterns, and enemies will have adjusted stats. Often, co-op focused titles can feel quite lonely in solo play, but of course, in Overlord: Fellowship of Evil, you have your minions to assist you. To help with this, solo players can command more simultaneous minions than in multiplayer (in this respect, it’s more like Overlord 1&2). Solo players will really need to master their minions, as they provide the enemies extra targets and make up for their Netherghūl’s weaknesses with their own abilities. None of the in-game narrative content is limited in solo play (you can do every quest in soloif you so choose). In Overlord: Fellowship of Evil, the players make their way through a series of quests, setting out from a hub location in the Netherdeep – the very deepest part of the Overlord world (save for the Abyss, which players visited in Overlord: Raising Hell). Guided by yourself, oh great Gnarl, and Ricket, these quests will take them through varied locations as they seek to rebuild the Netherheart, the hub’s equivalent of the Tower Heart from previous games, and, ultimately, bring a little evil back into the world! This story, with its twists and turns, forms the game’s narrative progression. However, there are other types of progression too. Oh my you do like to talk don’t you? No, I mean yes… Can I go now? No, but I find it amusing that you think we’ve finished… Character Progression… TALK! ARGHHHH! Errr…. We have four Netherghūl characters. Players assume one character at a time, though they can switch between missions. A single savegame contains all four characters. Each of the characters originally has a tomb – a kind of sarcophagus in the hub. When the minions fashion this tomb into a statue of that character, players can visit this statue to purchase character upgrades. These include things like improved stats, or more powerful variants of their attacks. As players upgrade themselves, the minions will improve their statue. One of the aims for players is to have all four characters fully upgraded, which completes all four statues. Yes yes they don’t care about that, tell us about the Minions. Yes sir, please just tell the one with the spiky hat to step back! Overlord: Fellowship of Evil features the Browns, Reds, Greens and Blues. Using gems picked up in quests, players can speak to prominent minions in the hub to upgrade each minion colour, unlocking improved stats and abilities for the minions. This also allows players to be able to utilise more minions of each colour, improving their flexibility in combat. The upgrade path for each colour is linear, but players can divide their expenditure between each colour. Players could, for example, max out the reds, or they could get two-thirds of the blue and green upgrades, or they could spread their gems around all four colours. There are benefits and drawbacks to each approach. Ultimately, players can max out all four colours, though this will take significant expenditure, so choose wisely! I’m going to send the blues off to pick me up a selection of stabby things, you have until they get back to tell us about the weapons in the game. Well we’ve got Ricket, the minions’ new weaponsmith. Early in the game, players will locate some dragon eggs, allowing Ricket to power up her forge and start offering her wares. Ricket can forge weapons for the players to use, and accepts weapon fragments as currency. These are found in various places in-game. Ricket’s weapons have a variety of evil effects, such as setting enemies on fire, or improving your ability to use minions. How will players know which Netherghūl suits them best? The player characters are designed to complement each other’s strengths and weaknesses. For example, Inferna is better at dealing focused damage in melee range to enemies, whereas Cryos deals area-of-effect damage over a wider area, though his damage potential is lower. This is pretty standard for top-down action games, but of course, Overlord: Fellowship of Evil has the minions to give this an extra dimension – Inferna excels at melee range, but can struggle against ranged foes. Fortunately, the red minions can kill distant enemies, and the brown minions defend her, creating extra targets for the enemies to attack. There are no limitations on character choice. Players can play each as a different character, or four of the same character, or any combination of characters they want. So if we do decide to share our power, how do we do that? 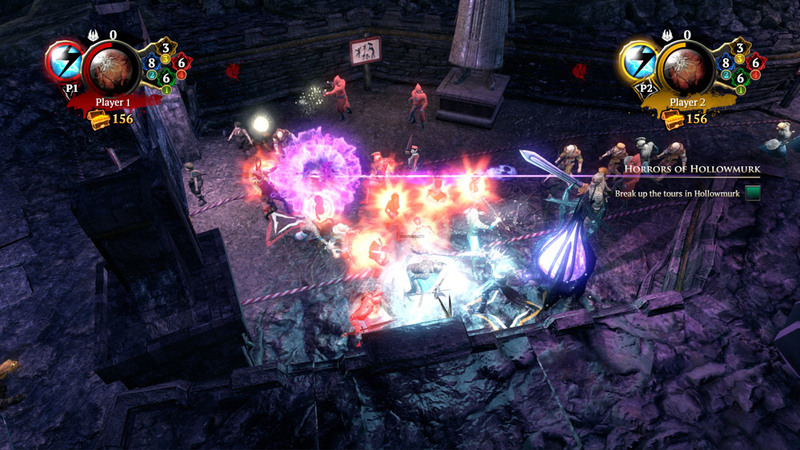 Overlord: Fellowship of Evil can be played locally, with up to four characters on the same screen, or online, with each player on their own machine. 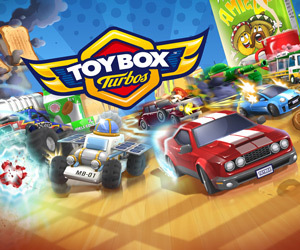 The game is designed to be as similar as possible regardless of which type of multiplayer you use. Additionally, every part of the game supports multiplayer – even the tutorial. We wanted to do this, after playing too many other games where multiplayer was “locked off” or “gated” into special modes or parts of the game. The game has settings for things like enemy spawns and stats, loot gain and various other areas that throttle based on playercount. This means the game is equally functional for a solo player as it is in 2, 3 or 4-player. Players can join-in-progress, while a quest is ongoing too. 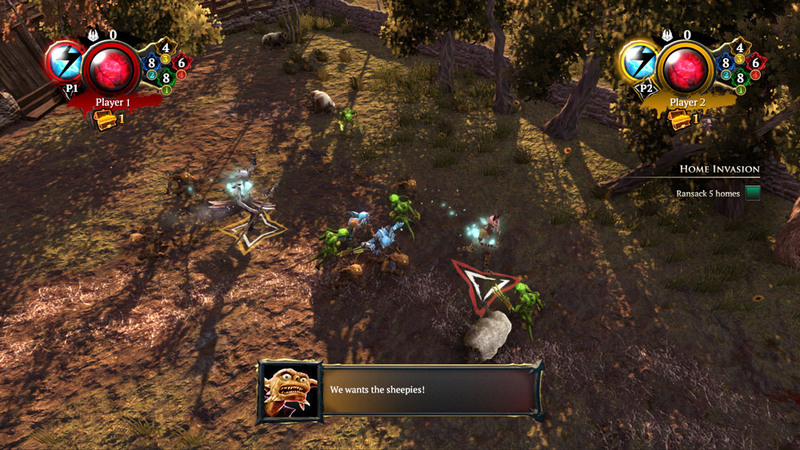 Multiplayer can yield a lot of loot for players, but Overlord: Fellowship of Evil has no “loot dibs”, or “round robin” loot system, or anything like that. The Netherghūl are competing with each other, so loot is a free-for-all! 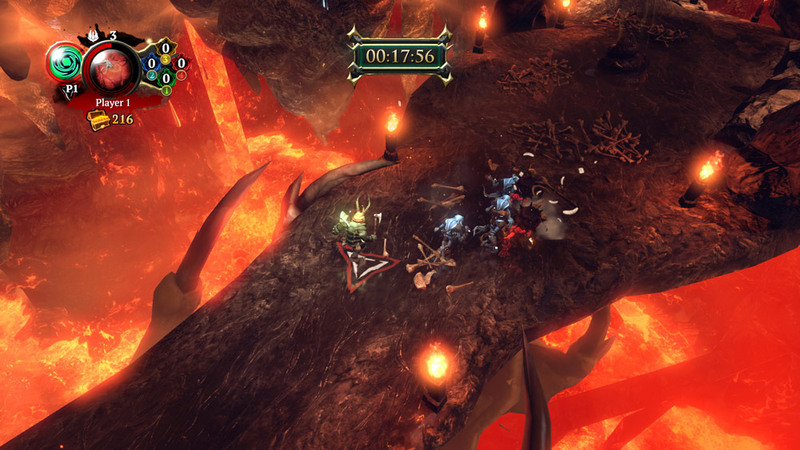 Additionally, some of the locations in-game have timed challenges players must complete; the first player to reach the end of these gains extra treasure at the end of that quest. There are no limitations in terms of narrative progression. If you have a friend who is playing the game, you can join them – regardless of where in the story each player has reached. This means that powerful characters could play with weaker characters. We have systems to “even out” the characters’ core stats a bit to help deal with this. Powerful players will still be more powerful than beginners, but the difference will not be so much as to ruin the game for either party. Well I must say you’ve been incredibly forthcoming with information, I won’t lie I’m a little disappointed – I was rather looking forward to using my new hot pokey stick. So can I go back to the surface now? No but we are going to insist that you to stick around, we’ve found you a nice little lava view house share with the browns. There are only 20 to a room so it shouldn’t smell too bad; we just need to talk about your holding deposit and search fees. Oh God no, nooo, noooooooooooooooo!